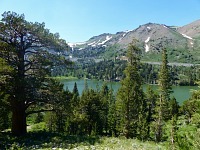 First stop: Red Lake, Sierra Nevada, still in California. 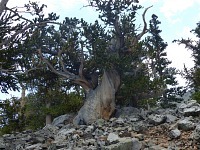 Bristlecone pines, two days and one state (Nevada) later..
We had planned our great summer vacation already back in May, when we got together with Jeanne and Tom at Wings of History. Since they had moved to South Dakota, we see each other little — and it turned out that they could use a crew for a race in Wyoming. 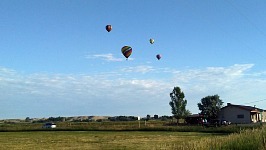 Eventually we built our road tripping break around the ballooning weekend. We set out unusually, on a Monday — and thus Lisa and I had both more or less recovered from our respective colds, but I got myself a sprained ankle instead. 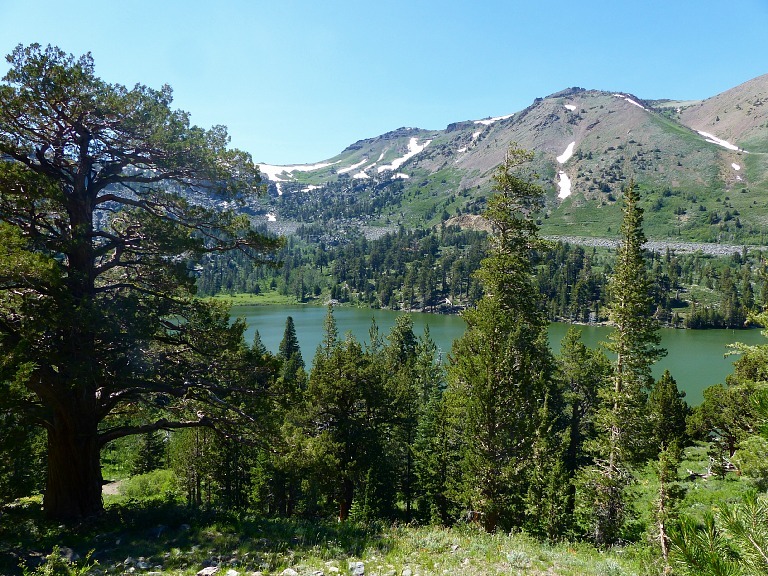 On the first day, we had counted on a stop in the Sierra, just to stretch our legs. In the end I managed to hobble up one side of Red Lake; we were surprised how acclimatized for the mountains we still felt, for hiking at eight thousand feet above the sea level did not present a problem. 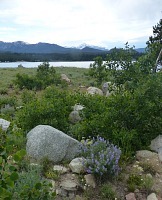 Interestingly, there was no snow around Red Lake, and many wild flowers were blooming — a year ago we had encountered the same in the nearby Carson Pass only by mid-August — it seems that the summer was really warm. A storm is gathering. 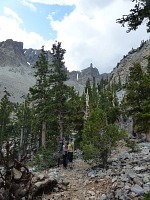 Wheeler Peak, Nevada. Looking westward, Harpers Corner, Colorado. Having overnighted in Minden, the next part of our journey took us to Ely. Theoretically, we could have tried to fit visiting Great Basin Park in the late afternoon, but in the end we just went swimming in the hotel pool and relaxed. We left Great Basin to Wednesday morning, and it was probably a good choice. 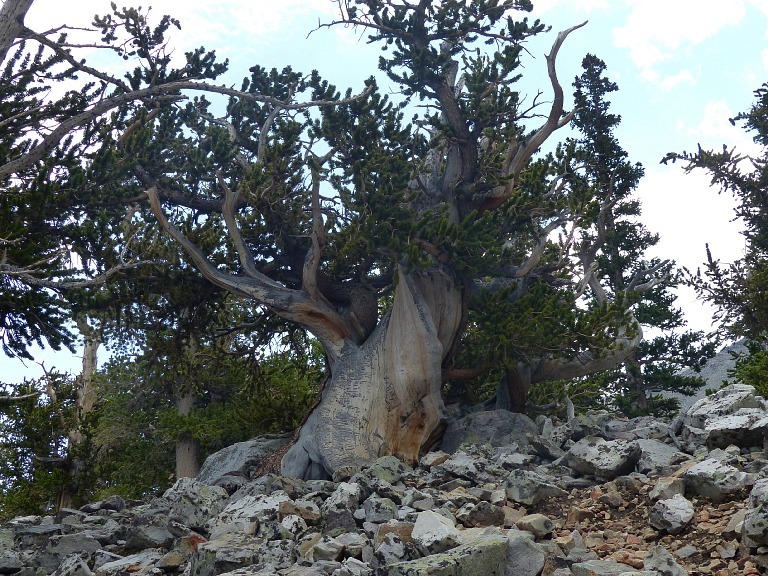 Around ten a.m. we set out on a trail to Wheeler Peak, which leads through a bristlecone pine grove, them being the oldest living trees on Earth. The sun was still shining, though clouds peeked up from behind the mountains. We reckoned we would make it before their ring closes overhead — and we did. 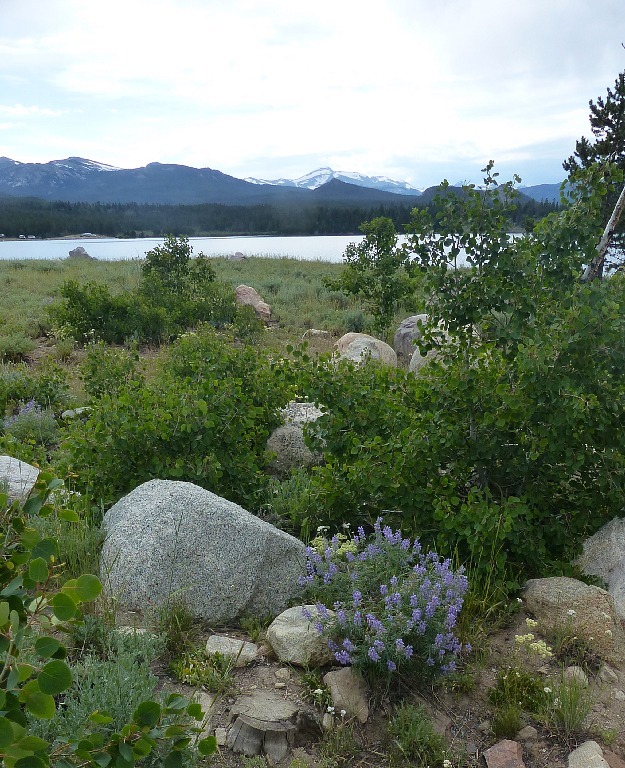 Last year's lesson from the Rockies is universally applicable — hike the mountains early in the day, before a storm comes. 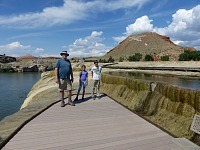 Then we jumped in our bus, finished the rest of Nevada and much of Utah, all the way to a town named Naples. Having crossed Utah, we also found ourselves in a different time zone, which had upset our routine a bit — in Spanish Fork, we looked in vain for some decent restaurant to have dinner at — all we could find was MacDonald's and similar, until we bumped into Bam Bam's BBQ. Given the fact it was a formica fast food joint, their meat was great. For the rest of this leg, one can mention beautiful Indian Canyon along Willow Creek. As its name suggests, old Indian trail led through here; nowadays, cows graze here and in lower elevation, crude oil is being pumped out of the ground. Despite all that, it is still an unbelievably beautiful place, and the view of all the green was very refreshing after all the Nevada deserts. 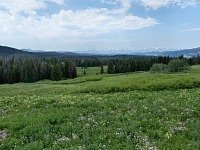 Looking to the east, Harpers Corner, Colorado. 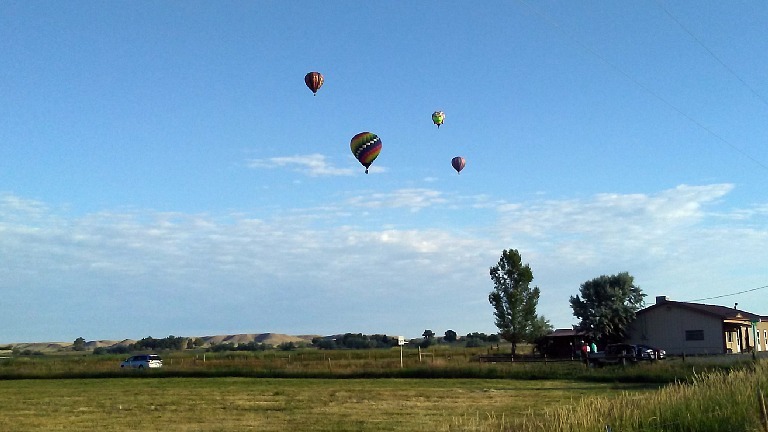 In Wyoming we got together with s Jeanne and Tom — and their balloon, Dragon Moon. In Naples, we slept in a brand new, but tiny hotel. In the morning we ignored all the dinosaur statues pointing to local fossils, and drove off to Colorado, to enter the Dinosaur National Park from the end, which is not overwhelmed by tourists. Having been here the previous year, we then had not enough time and gas to check out the full length of the cliff with a view named Harper's Corner. The very view-point requires a bit of hiking, and despite having gotten there already by ten in the morning, the sun blasted us like crazy. A path led us to a precipice over Green River, with views to classic Colorado panorama — fantastic river canyons carved into colorful layers of mesa rock. In this case, there's also a view of the meeting of rivers Green and Yampa. 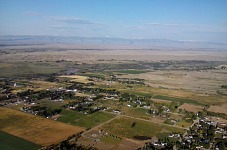 After such exercise, we were bound to jump back in our car and endure an all-day transport to our destination, namely Riverton, Wyoming. For us, Californians, even the journey through the landscape was interesting, as it often looked like a back-drop for a good old western movie — endless plains interspersed with bizarre rock formations, easily able to provide cover to a whole army of bad guys. What captured our attention most, and what followed us since Utah, was a feeling of order. Small ranches, often with only a prefabricated homes, a small herd of cattle or horses, contentedly grazing, no luxury — but no junk around, either. Perhaps when one fights for survival in the middle of much empty space, one cannot afford to break things and just throw them away. And honestly, considering the hard winters, it's likely a good idea to keep your vehicles and source of heat and food under a roof, without having to wait till June thawing. The river re-appears and flows on at full volume. Sinks Canyon, Wyoming. When we spotted a restaurant named Chopstix on our way to our hotel, we stopped right away for dinner. To be honest, we did not have many expectations this deep inside the continent, but the food was excellent. 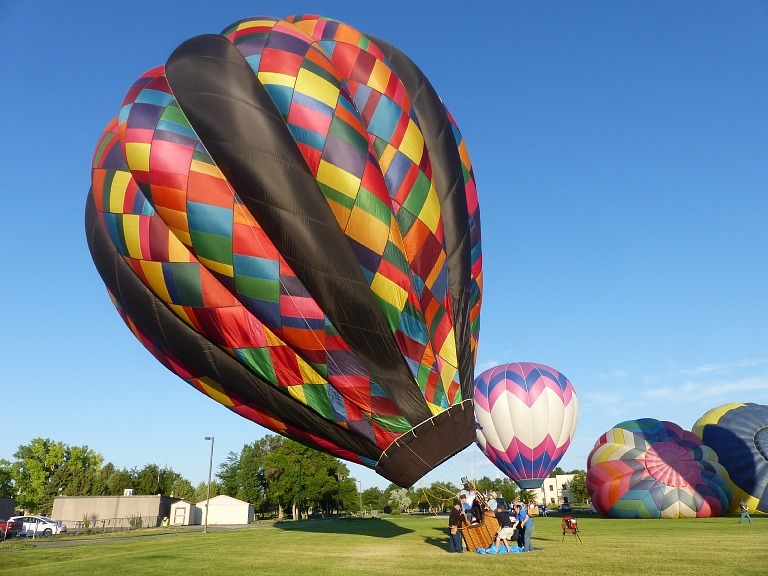 We arranged things with Jeanne and Tom for the morning, and hurried to the hotel to sleep — we were going to get up before sunrise, as it happens with ballooning. We pondered a bit about how to orient ourselves before dawn in a strange town, but it turned out simple — we encountered a car towing a ballooning trailer on the first deserted intersection, and we followed it all the way to local college sports field. The Balloon Rally proceeded according to a classic script; one stands around a lot, and much is being organized at length. Our crew needed a local guide to help with navigation during chase, for neither we, nor Jeanne and Tom had flown in Wyoming before. 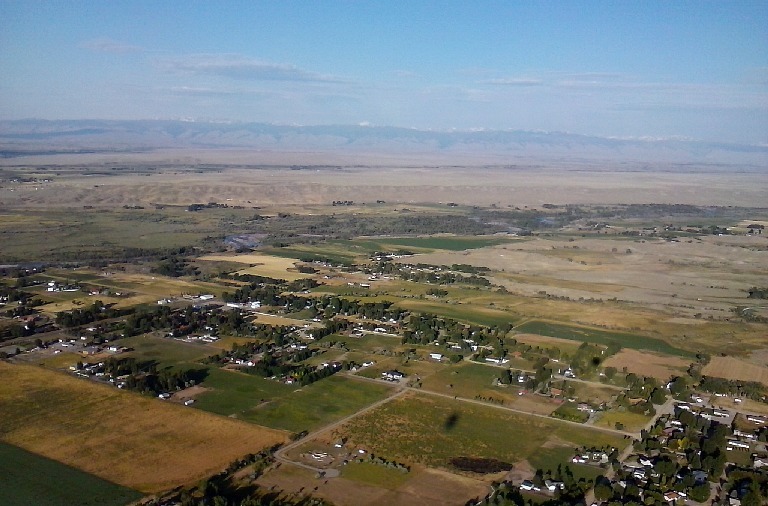 Riverton is spread out along the banks of Wind River — actually, only one of them, while the other bank not only remains undeveloped, but has no roads to drive on, and it's highly inadvisable to land there with a balloon. No-one could get to the flight crew, and there would be no way to transport the balloon back to civilization. 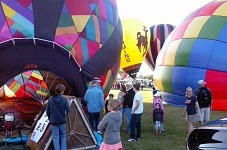 Ballooning again on Saturday morning. The balloons ended up so soon that we still managed to get our breakfast at the hotel. Sid and I went to the front test and engaged in talk with the receptionists — locals usually know best what's interesting or unusual in the area. 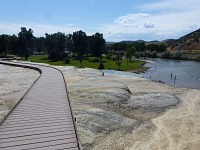 We had to explain a little that our word park does not aim to describe a local playground for kids, but rather a natural park; we got recommended Sinks Canyon and hot springs in Thermopolis. After we caught up a bit with our sleep deficit, we headed to Lander and the park beyond. 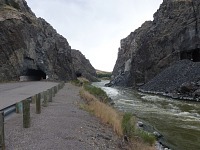 A creek named Popo Agie disappears in one spot under a hill, into a maze of limestone caves, to emerge a quarter mile further down from under the hill on the opposite side of the canyon. Test with colors had confirmed that it was the same river, but one mystery remains — depending on the water level, it takes the river between two and four hours to span those surface four hundred meters underground. Apparently, the river has a beer or two, sits down, watches a TV show, and continues on its way. Popo Agie (pronounced Puh-po Shuh) is believed to mean gurgling river in the language of the Crow Indians — the creek descends from almost ten thousand feet elevation to six thousand at the sink (five thousand near Lander), where it forms, with other creeks, Wind River. Being proper tourists, we visited the sink and then trekked the quarter mile to the spot where it again emerges on the surface. I had expected something dramatic, a stream jetting from a rock or so, but a quiet pond with a sandy bottom, from which the river quietly moves on, is much more mysterious than an obvious rise. A bunch of fish lives in the pond — trout migrating upstream cannot go any further and park at this pleasant terminal. It's pleasant because fishing in the park is forbidden, and there's a fish food dispenser installed there, which drops a handful of smelly balls into a tourist's palm in exchange for a quarter dollar coin, and the balls can be tossed to forty-inch scaly loungers under a viewing platform. ...and had they not forgotten a proper camera, we could have had better pictures. 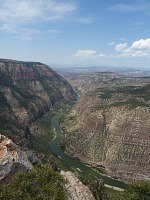 We were curious about the rest of the canyon, and so we drove up the road to a view overlooking it from a ridge. Down in Riverton, it was close to ninety degrees, while here in the mountains it was pleasant eighty. Alas, the skies threatened us with classic thunderstorms, and we did not linger much. Still the canyon deserves further exploration; it promises a hike to waterfalls, and the whole formation has a rich geological history, from granite tops with scrub vegetation, all the way to flood meadows under the hills. It's also a rock climbing area, but that we had noticed when having got there. Later in Lander we discovered a museum of wild west, but it was past their closing time and we committed it to memory as a possible attraction for later. On Saturday, our morning drill with balloons repeated. With a fault, for none of us remembered to take our proper camera along. And of course this was the day I got lucky an got to fly. Jeanne took me in the basket and I could admire the view of a meandering river, and snow-capped mountains in the distance — and take pictures with my completely miserable phone. Nevertheless the rest of my family was quite jealous. Hot springs in Thermopolis, Wyoming. Locals entering the river caught our attention. For this afternoon, we thought of a trip to hot springs in Thermopolis. The sheer size of the attraction had surprised us. 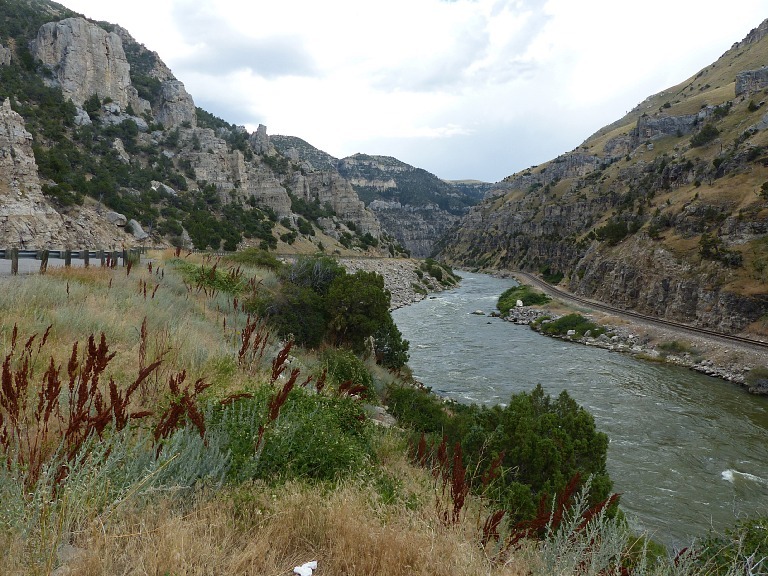 Eight thousand gallons (thirty cubic meters) flow through the cascade into the river, which in this place is called Bighorn River (but it is still the same stream called Wind River in Riverton). City bath is located in the park, where you can splash for free for up to twenty minutes in a hot pool. This we definitely planned to do — but only after seeing some bisons and walking around the actual springs. 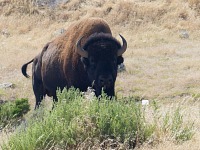 Bisons are naturally disinterested in tourist crowds, and thus we did not spot even one hoof in the state park. Yet we localized darks heaps of muscle across the state route, out of the park, and we drove over to gape. After having walked around the cascade of hot springs, we concluded that there was no real need to visit Yellowstone after seeing this hit; then we noticed locals entering and swimming the river under the springs. Thus we belayed visiting the bath, and proceeded to check out benefits of nature competing with tiled pool. 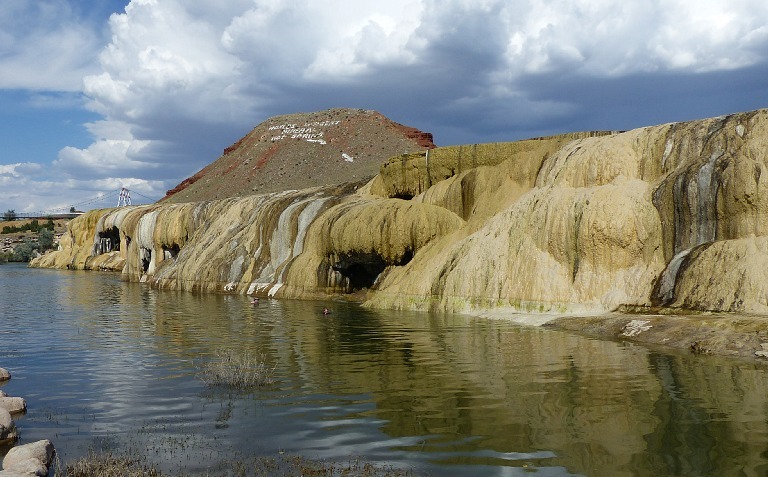 As far as I am concerned, swimming in hot springs is probably the strongest experience of this whole trip. 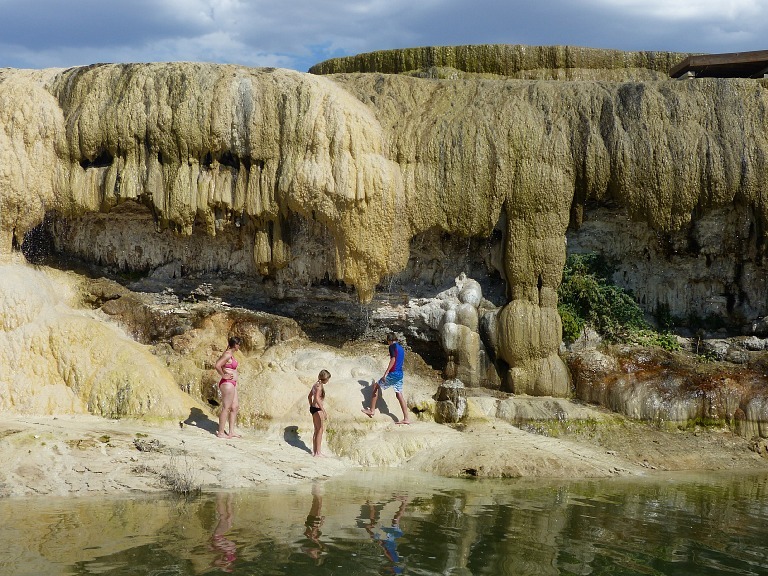 A cascade of hot springs heats the water in the river to pool temperature, once can lounge under various little waterfalls and natural showers, and besides, where can you get such an easy access to hot springs? We tried it, too, and the river was so warm, even Hippo went in. One could take a hot shower under the spring. We had an appointment for a family dinner with Jeanne and Tom, and their friends, and it all was mildly social and very pleasant. 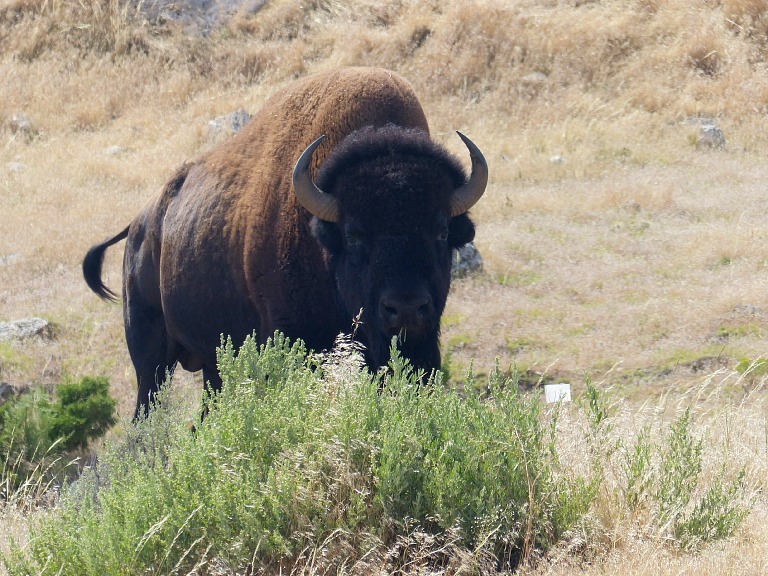 Meanwhile we decided to extend our stay in Riverton by one night past Monday, to be able to cover Buffalo Bill Museum in Cody. A hotel receptionist agreed that it was no problem, and she spent the subsequent two hours working out how to arrange it — our room had been already assigned on Sunday night to a large group, and thus we had to move. 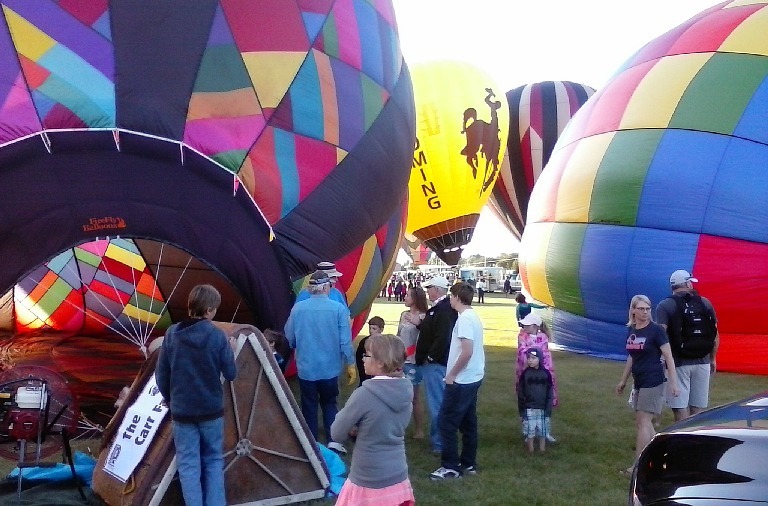 We suggested that we could move right away, for in the morning we would be flying balloons and won't have the time. But then she could not find a room that was free on both Saturday and Sunday nights. Eventually we gave it up and looked to having to deal with it on Sunday morning. When we were already in our beds, the receptionists called with a victorious claim that she found one for us — and we, wearing our pajamas, went through a Chinese fire drill of moving one level up. On Sunday morning, practically in the same moment, my alarm rang, and an arriving text message chimed — Jeanne was writing that she had been sick throughout the night and there would be no flying. I admit that I was glad to be able to sink back in my bed, and we quickly caught up with some more hours of sleep, before setting out to Cody. 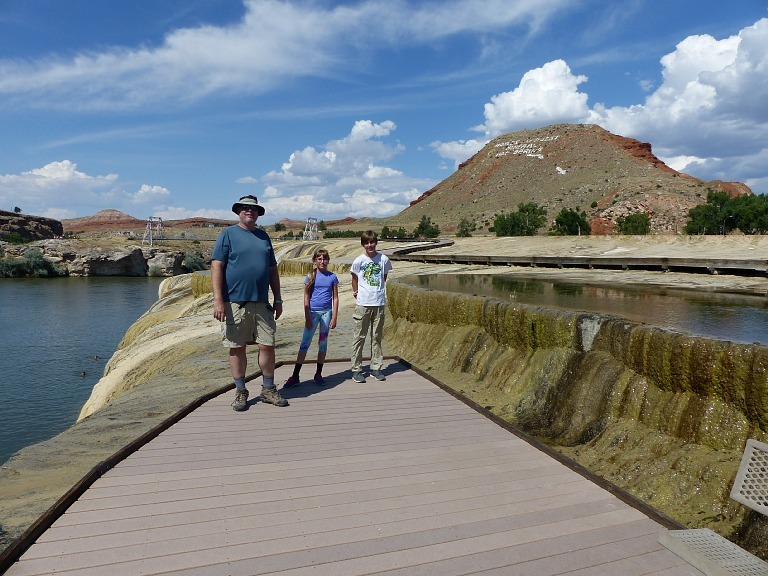 The museum in Lander was closer, but Cody had promised more attractions, and one goes there through Thermopolis — and we would add bathing in the mix. The town of Cody, as its name suggests, was founded by the very William Frederick Buffalo Bill Cody. A famous museum, for which we endured the long trip, is truly worth it. Besides displays devoted to the actual man Cody, they show a very nice overview of local flora and fauna, there's a gun section, a Wild West section, and one devoted to Indians. For a while we toured together, but in the end we split — gentlemen went to admire weapons, and Lisa and I headed for the Indians, a fascinating view into a society placed more or less at stone age level, lacking wheel and similar civilizing inventions. Driving back, we got chased by storms. 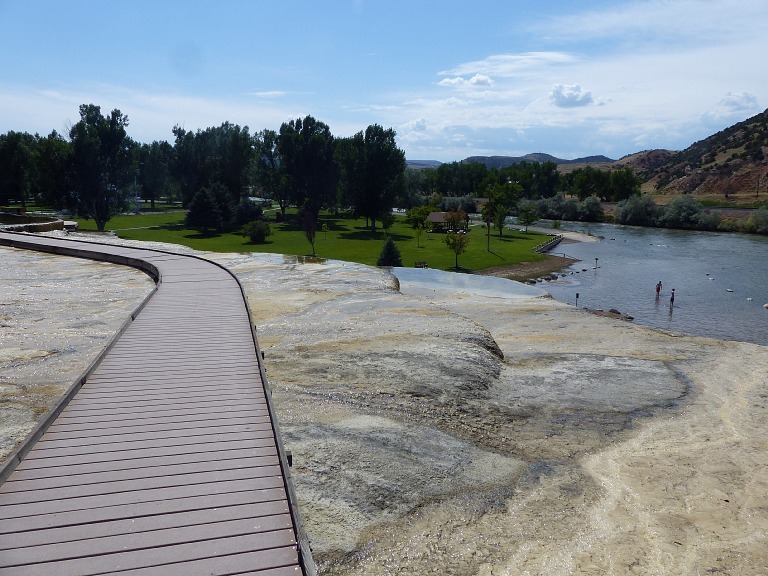 We looked forward to hot springs in Thermopolis, but what a disappointment! It turned out that storms had cooled off hot water into cold and muddy. As a consolation prize, we located an excellent Thai restaurant in town, and had a proper home-style meal. 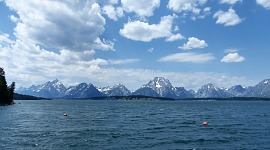 A view to Grand Tetons, Wyoming. Choosing from many variants on which way to return, we reckoned that it would after all be simplest to drive through Grand Teton National Park. 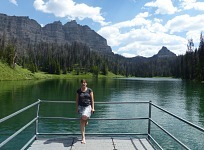 On our way, we stopped at an overlook to the distant Tetons and then at a random, beautiful small lake. The Park fulfilled our worst expectations — in a line to one of the three entrance booths, we spent about thirty minutes. Trundling in a bumper-to-bumper traffic ensued until the dam of the Jackson Lake. 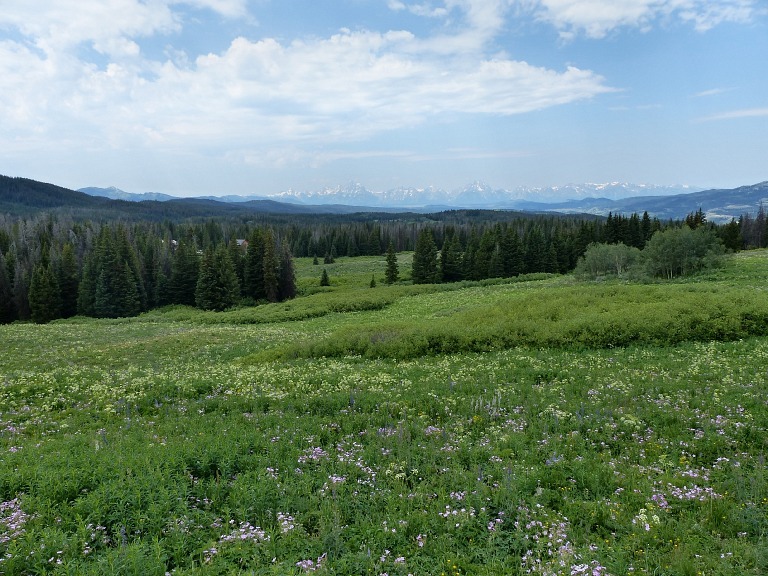 Fortunately for us, crowds accumulated near the parking lot, and when we walked a bit off, we got a relatively unpopulated view at an impressive mountain range panorama. More trundling followed, to Jenny Lake, where a woman in a reflective vest declared that a parking lot was full and we were to park in a ditch, walking the rest. We obeyed, subsequently finding about twenty or thirty empty spaces in the alleged lot. 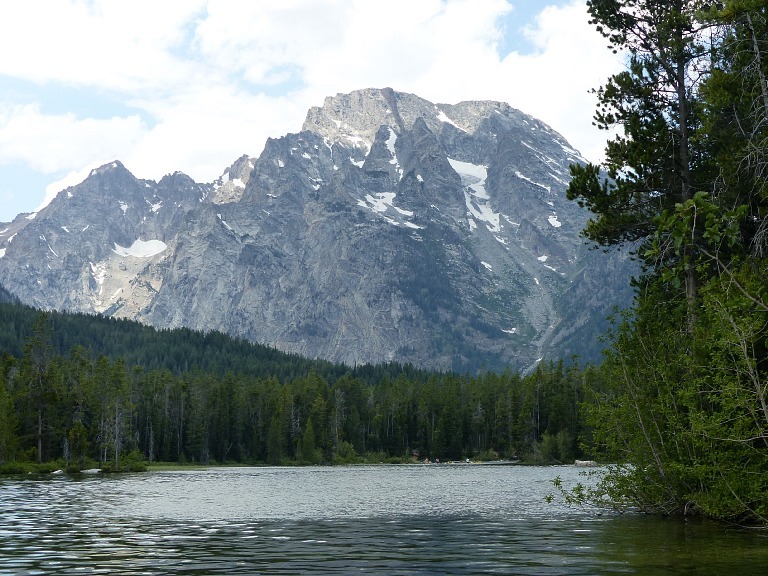 According to guide and ranger recommendations, we set out on a hike alongside String Lake. On a wide path leading through woods, lacking any interesting views, among screeching tourists on the road and hollering water enthusiasts in canoes and paddle boards on the lake. 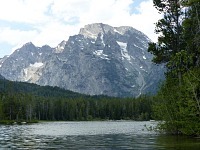 Lisa demanded to splash in the lake, and so we stopped and did wade a bit on the edge, but heavy clouds over the mountains did not leave us doubting that the usual afternoon program was approaching — a thunderstorm. We hiked back very briskly and got only a little bit wet. I feel a bit of schadenfreude that all the hail that came down only after we found safe shelter in our car, had cooled off some of the screechers and hollerboys. 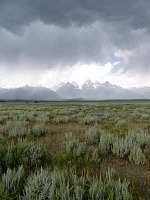 As soon as we drove out of the foothills, the rain stopped, and we could watch across the prairie how the peaks wrap themselves in dramatic clouds. We had hoped to see some wandering bisons on the plains outside the park, as we did seventeen years earlier, just Sid and I, but we did not spot even a bunny rabbit. It did not really surprise us — even we felt a strong urge to flee this tourist chaos, and we think we're tame and domesticated. A many-mile long traffic jam leading to Jackson Hole, whose streets we navigated at about the same pace as one elderly lady did on her bicycle on a parallel bike-path, was no surprise either. We had reserved a hotel room in Pocatello, with only one mission — to re-visit Portneuf Valley Brewery. This time we headed there with certainty that they also serve good food, and took our children along. I must say that their beer is much better that the more solid stuff. One could write whole novels about the local beer, but I am afraid that the lowly beer does not inspire exquisite fanciers like wine does, and my shallow vocabulary fails to cover the nuances. Still I maintain that this is the best beer in the world, at least of those I had ever tasted. 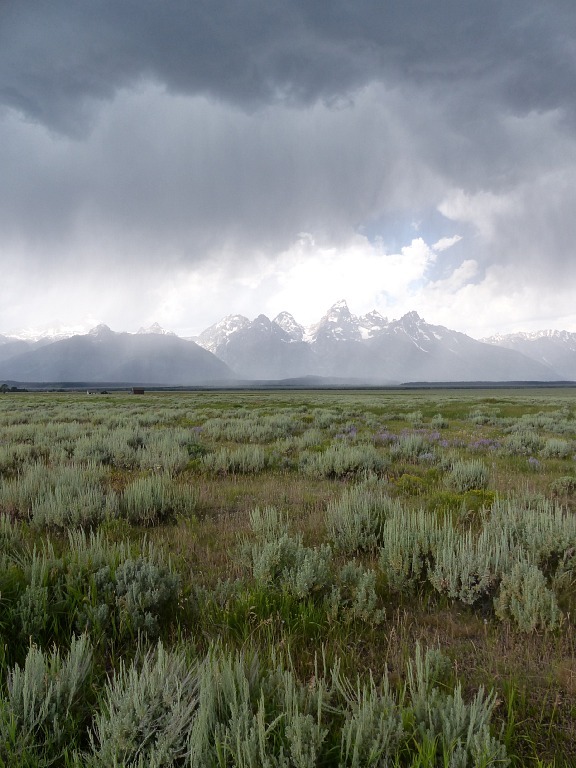 Storm over Grand Tetons (notice the absence of bisons). 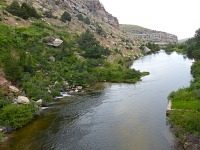 For Tuesday, we had planned to finish crossing the last corner of Idaho, then the whole Nevada all the way to Reno, close to California border. 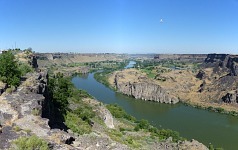 We dawdled a bit in Twin Falls, after a beautiful view to the rather developed Snake River Canyon opened up from a bridge. Yet we had reached Reno by five in the afternoon (in part thanks to crossing a time zone) and after a few moments of hesitation concluded that we could get home, instead of finding a hotel and spending one more night abroad. We went food shopping, just to stretch our legs and to have something for breakfast, had an early dinner — simply an almost two hour break — and half hour before midnight we got home. That day, we had been traveling for fifteen hours, some thirteen of that were truly on the road; we covered eight hundred forty miles (thirteen hundred fifty kilometers). Altogether we accrued three thousand hundred ninety miles (five thousand hundred thirty kilometers) across six states. We hiked in four distinct mountain ranges, have seen trees five thousand years old, bathed in hot springs, visited a world class museum, flew in a hot air balloon (that is, select individuals :-)) and listened to Discount Armageddon a Midnight Blue-light Special by Seanan McGuire, and most of Good Omens by Neil Gaiman and Terry Pratchett. But mostly we have visited many beautiful places, and at least I figured one thing out — I would like to live in Wyoming.